Thank you all for the encouragement, comments, likes and follows. There are some of you that have a special place in my heart now. When I first began blogging, you were the ones to always comment on my post, and were always willing to share constructive criticism. With out all of you, I probably would have turned tail and given up long ago. Instead I’ve kept at it, and have made many new friends. Blogging 101 and 201 helped out a lot also. That’s where I have met most of you! Although I’m still kinda new to all of this, y’all gave me the courage to keep at it! You will never know how thankful I am to each and every one of you! So again, Thank you very very much!! Today’s task: develop a regular feature for your blog. Today’s task for Blogging 101 is to develop a regular feature for your blog. I have been thinking about how to do this for a couple hours now and believe I’ve made a decision. Word Crush Wednesday will be continued as well as a regular weekly Book Review. The reviews will be posted on Tuesdays. If I have not read a new book to review that week I will be talking about some old favorites, or something I want to read. If you have any suggestions please send them my way. I am always looking for something else to read, no matter how many books I have piled up. Then on the open days be prepared for whatever it is I’m thinking about. I have now joined Facebook! Thanks to Blogging 101, of course. I had not even thought about doing a page there, as most of my family has no idea I even have a blog. I am also thinking about trying to do a custom site icon in the coming days. No clue what that will be yet, any suggestions welcome. When Blogging 101 is over I will be lost and looking for something to do daily. You have officially been warned. If you have a Facebook you can look me up here. Also, if you have a Twitter you can find me here. 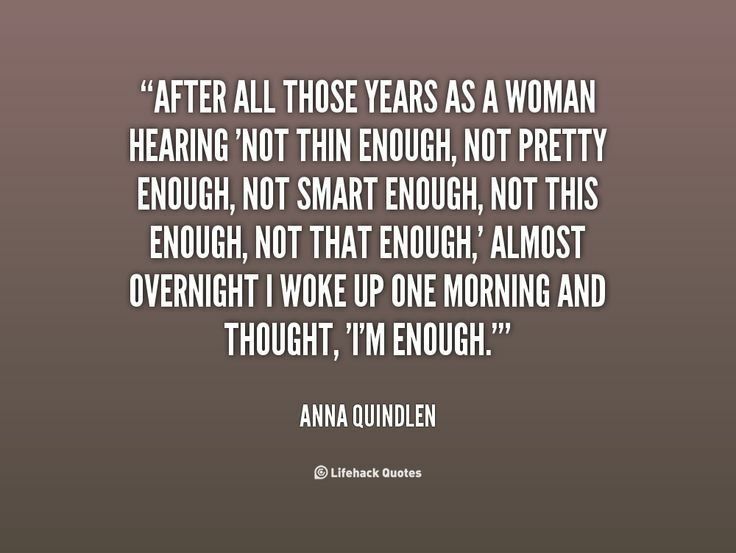 I chose this Anna Quindlen quote for my very first #WCW (Word Crush Wednesday) quote. I was looking around wanting to use something I hadn’t seen anyone else use, then this popped up. How many times do we look in the mirror and think we’re not pretty enough, or thin enough? Talk ourselves into believing we’re not smart enough, or funny enough. As women, and some men (cant leave them out) we have a tendency to overthink EVERYTHING, and in turn we put down on ourselves without even noticing it. This my friends is a horrible thing. No matter your size or shape, if you are a good person or at least do your best to be, then you are beautiful. It’s not what we see on the outside that determines beauty or brains, it’s the inside. I’m a firm believer in that. Husbands and wives are the same; they need your love and attention. Make the effort and make it 100-100 instead of 50-50. Don’t give and take, just give and expect nothing in return. f you are going above and beyond what is expected, s/he will notice, trust me. I will stop my ramblings now but I am going to leave you with yet another quote from a book I really enjoyed. Remember it! Today’s task: read six posts written in response to the same prompt, from yesterday, and leave comments on at least two of them. First of all, I loved this task. It made me go back and rethink everything I wrote yesterday while reading other blogs. This task made me realize just how important it is to keep looking for new blogs to follow. Every time I start looking new favorites pop up. Here are a few of the daily prompts from First Sight that I really liked. Enjoy! Becky G? Oh, That’s Me! Whether a person, a pet, an object, or a place, write about something or someone you connected with from the very first second. Books! Did I say that loud enough? I know, it’s not what pops in most peoples heads when they think about “First Sight.” But I do. The truth is I’m an introvert. Always have been. I remember being read to growing up but it wasn’t the same as picking up a book and reading it all by myself. The first book I REALLY remember reading was Dreamland by Sarah Dessen, which is still my favorite book, while in high school. After that, I read any book I could get my hands on. Thankfully my English teacher let us borrow books and family members would bring me to the library. Now however many years later, I still love to read. I love to feel what the characters are feeling. Travel where ever they are, and smell what their smelling. I know that sounds crazy to some people, but if you love books like I do you understand exactly what I mean. You know how it feels to physically be at home or sitting in a doctor’s office while in your head your millions of miles away. The feeling you get when your trapped inside a book is wonderful. That’s why it was love at first sight, and still is. Every time I open a new book it starts all over again. Then there are the books that don’t make you travel, they make you stay exactly where you are and think. Those books are also good, the only bad books are the ones unopened. The key is to know yourself and where you want to go when you pick up a book. If I want a vacation I go for the dreamy summer reads or love stories. Mysteries, Crime and suspense novels are always my top picks for forgetting my own life for a while. Then there’s biographies and true stories, these are the ones that make me think. Some may have certain reads for certain moods also, but may not be the same as mine. That is what makes books so wonderful. Each book does something different for each person that reads it. I wish for everyone to have this feeling when they open up a book.